David Orchard led the anti-war campaign across Canada relentlessly mobilizing support against NATO’s war on Yugoslavia. March 24, 2018 commemorates the 19th anniversary of NATO’s war on Yugoslavia. This article was originally published on Globe and Mail on March 26, 1999 (published in a slightly edited version). Following the lead of the U.S., Canada is participating in a massive military assault against a sovereign nation in central Europe. The Federal Republic of Yugoslavia is a small country of approximately 12 million. Its crime is that it is fighting to preserve its territorial integrity against an armed secessionist movement. Every other nation would do the same. When Abraham Lincoln went to war against the Confederate South “to preserve the union,” as he put it, he was regarded as a hero and Washington bore long and vindictive grudges against any countries — including Canada and Britain — that did not leap to support it. Has not Britain waged a decades long war against the Irish Republican Army? Was it not a Canadian government in Ottawa that invoked the War Measures Act and moved troops into Quebec when faced with “apprehended insurrection”? We are told that Yugoslavia refused to sign a “peace agreement” with its armed separatists. There is no peace agreement. There is an 81 page document, drawn up by the U.S. which will in effect sever Kosovo, long regarded as the cradle of Serbian nationhood, from Yugoslavia. Belgrade was told to sign or be bombed. The majority of the population of the separatist region are of a different ethnic group than those in the rest of Yugoslavia, we are told. If this were justification for secession, most nations in the world, including Canada and the U.S., would disintegrate overnight. A long political and media campaign to demonize the Serbs has culminated with Bill Clinton‘s comparison of war-torn Yugoslavia to Hitler’s Germany. Equating a weak, already partially dismembered country under economic sanctions for almost a decade, struggling to hang on to its heartland, surrounded and menaced by the world’s most powerful nations armed to the teeth with the latest high tech weapons, to Nazi Germany only goes to graphically illustrate graphically that truth is the first casualty of war. Lest anyone be confused, the attack on Yugoslavia is not a United Nations operation in any way, nor does it have U.N. sanction. Both Russia and China have condemned it unequivocally. It is a unilateral and unprecedented act of war by the world’s most powerful military alliance in violation of international law and of NATO’s own charter, which provides for defence in the case of attack against a member nation. No member nation of NATO has been attacked or threatened by Yugoslavia. Why is Canada, the famed peacemaker, involved in the illegal destruction of a founding member of the U.N. and our ally in both world wars? Today, Yugoslavia is virtually defenceless, yet with a long and proud history of fighting for its independence — for almost five centuries the southern Slavs led by Serbia fought against the Ottoman Empire, for years Yugoslavia fought against Hitler’s Nazis and, under Tito, against control by the Soviet Union. As in Iraq, many of the bombs and missiles raining on the people of Yugoslavia are coated with depleted uranium. The radioactive fallout will, as is happening today in Iraq, ensure an agonizing death for tens of thousands in the years ahead, long after the bombs stop falling. After years of pious bleating by Canadian governments about war crimes (always those by small nations, mind you), we are committing one of vastly larger proportions as these words are being written. Who has given NATO the authority to attack Yugoslavia? What exactly is the Kosovo Liberation Army (regularly described as a terrorist organization less than a year ago) on whose side we are now entering this conflict? How, and with what financial backing, did it emerge as a fully equipped army complete with anti-tank weapons, uniforms and grenade launchers? What is its connection to U.S. intelligence and, as recently reported in the London Times, to organized crime and the heroin trade? 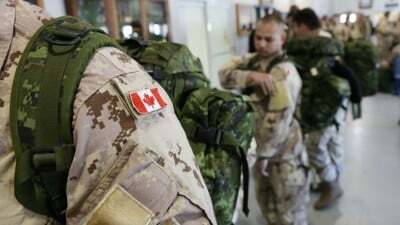 If NATO has become an instrument of terror against the virtually defenceless population of our former ally — and it has — Canada should reconsider its membership in that organization. David Orchard is the author of The Fight for Canada – Four Centuries of Resistance to American Expansionism. He ran twice for the leadership of the Progressive Conservative Party of Canada. He was convenor in 1999 of the Ad Hoc Committee to Stop Canada’s Participation in the War on Yugoslavia. He farms in Borden, SK and can be reached at [email protected].